Shallow, protected freshwater tributaries such as lakes, ponds, reservoirs, streams, creeks and river coves. Prefers quiet, slow-moving waters with lots of vegetation and a sandy, muddy or gravel bottom and usually stays close to the shoreline. Can be found in brackish waters as well. Schools in deeper river channels in winter. Common in freshwater tributaries throughout the Chesapeake Bay watershed. The pumpkinseed is a bright, beautiful sunfish with a saucer-shaped body that is mottled orange, blue and green. 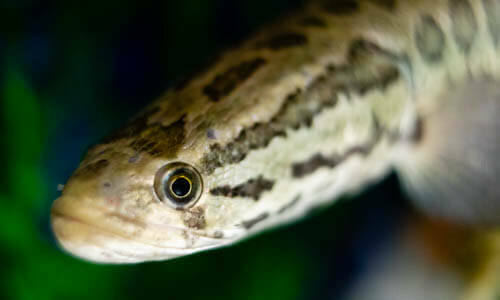 It lives in freshwater lakes, ponds and streams throughout the Chesapeake Bay watershed. The pumpkinseed's compressed, saucer-shaped body is mottled blue, orange, yellow and olive green. Wavy blue and orange lines appear on its cheeks. It has an orange belly and black earflaps with a bright red or orange, crescent-shaped border. Its slightly forked tail fin has rounded lobes. Its dorsal fin has about 10 spines on the front portion and a rounded back portion. This fish usually grows 4 to 6 inches long, but can grow to 12 inches long. The pumpkinseed eats a variety of small organisms, including snails, worms, insects, mollusks, small fishes and bits of vegetation. Larger fish, fish-eating birds (such as hawks, herons, cormorants and waterfowl) and fish-eating mammals (such as raccoons) prey on pumpkinseeds. Humans, particularly young anglers, will hunt the pumpkinseed. 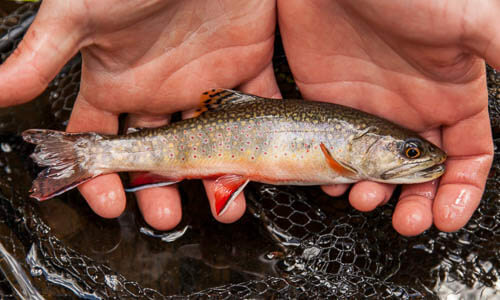 Spawning occurs from May to July, once water temperatures warm to about 68 degrees Fahrenheit. Males build nests in shallow areas by making a round hole in the sand or gravel. Pumpkinseeds will often build nests close to one another, creating colonies. The female lays several hundred eggs into the nest. 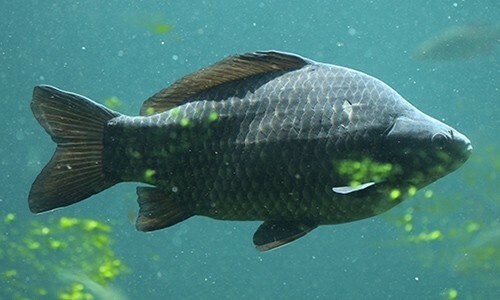 The male fertilizes the eggs, then guards them from other fish and predatory insects. He uses his tail to fan away any particles or detritus that could smother the eggs. Eggs usually hatch in 3-5 days. Once hatched, the young fish (called “fry”) swim into the shallows, where they are protected in beds of underwater grasses. Young fish reach maturity at 1 to 3 years old. Pumpkinseeds live 6 to 8 years in the wild and longer in captivity. The pumpkinseed can be confused with the bluegill, another sunfish. Pumpkinseeds can be distinguished by the wavy stripes on their cheeks and the bright red or orange border on their earflaps. However, bluegills and pumpkinseeds often interbreed, resulting in some confusing hybrids. They are a favorite of young anglers because they are playful and very easy to catch. Pumpkinseeds will eagerly bite onto nearly any small natural or artificial bait. Pumpkinseeds are well-known for being a delicious fish to eat.